President Obama, members of Congress and other officials expressed their sadness today about the news that former Alaska Sen. Ted Stevens was killed in a plane crash Tuesday. They shared personal anecdotes about the former senator and praised his commitment to the nation and the state of Alaska. "A decorated World War II veteran, Senator Ted Stevens devoted his career to serving the people of Alaska and fighting for our men and women in uniform," Mr. Obama said in a statement. "Michelle and I extend our condolences to the entire Stevens family and to the families of those who perished alongside Senator Stevens in this terrible accident." At least four others were killed in the crash near a remote fishing village in Alaska. Former President George H.W. Bush said in a statement, "Barbara and I mourn the tragic loss of Senator Ted Stevens, a respected friend of longstanding, and send our most sincere condolences to his family. 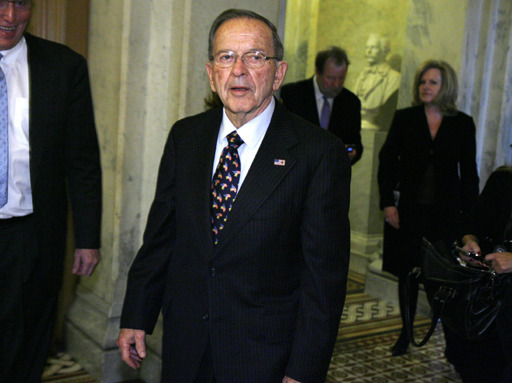 Ted Stevens loved the Senate; he loved Alaska; and he loved his family -- and he will be dearly missed." Former Alaska Gov. Sarah Palin mourned the loss of Stevens in a Facebook note entitled, "Alaska's Tough Warrior, Ted Stevens." She noted that in 2000, Stevens was voted "Alaskan of the Century." "Alaskans know how much we owe to Senator Stevens, but all Americans owe him a debt of gratitude for his leadership on many issues, including the crucial energy issues that fuel American prosperity," Palin wrote. "Two years ago, he sat at my kitchen table over a salmon lunch, and we talked about our long anticipated Alaska natural gas pipeline and our mutual commitment to have the Last Frontier's rich resources contribute to America's quest for energy independence." She also praised Stevens for his promotion of equality in education, and his support of Title IX legislation. Senate Republican Leader Mitch McConnell noted Stevens' military service, defense of the military and his involvement in the statehood of "The Last Frontier." "In the history of our country, no one man has done more for one state than Ted Stevens," McConnell said. Alaska Sen. Lisa Murkowski said in a statement that she lost a "dear friend," and Alaska lost a "hero." "The thought of losing Ted Stevens, a man who was known to business and community leaders, Native chiefs and everyday Alaskans as 'Uncle Ted,' is too difficult to fathom," she said. "The love and respect that Alaskans of all persuasions feel toward Ted Stevens is on a par with what the American people felt towards leaders such as John F. Kennedy, Dr. Martin Luther King, Jr. and Ronald Reagan." Alaska Rep. Don Young said the plane crash was a "tragedy" and that Stevens was a close, personal friend of his. "I used to babysit his kids, and he would babysit mine," Young said. "He's been my mentor, first in the State Legislature, and then as our Senior Senator and I will miss him a great deal." Sen. Dan Inouye, a Democrat from Hawaii, said in a statement that he and Stevens shared a special friendship. "When it came to policy, we disagreed more often than we agreed, but we were never disagreeable with one another," Inouye said. "Senator Stevens and I worked together to ensure that the small non-contiguous states of Hawaii and Alaska were not forgotten by the lower 48 and to ensure that the nation awoke to the importance of the Pacific for our economy and international relations... I have lost my brother."